For other people named Frank Jordan, see Frank Jordan (disambiguation). Francis Michael Jordan (born February 20, 1935) is an American politician, former police chief, former mayor of San Francisco and a foundation executive. Jordan was born in San Francisco in 1935 and graduated from Sacred Heart High School in 1953. He studied political science and government at the University of San Francisco during his time on the police force and graduated in 1975. Before becoming mayor, Jordan served as the Chief of the San Francisco Police Department from 1986 until 1990, at which point he resigned to run for mayor. He joined the force in 1957 and was named Chief of Police by then-Mayor Dianne Feinstein in 1986. Jordan succeeded Art Agnos as the Mayor of San Francisco from 1992, until 1996. Jordan continued Agnos' campaign against the city's chapter of Food Not Bombs and introduced a controversial program called Matrix which aimed to deal with the city's homelessness problems. During his mayoral tenure Jordan played a role in converting the Presidio Army Base into part of the Golden Gate National Recreation Area, bringing Bay Area Rapid Transit to the San Francisco International Airport, keeping the San Francisco Giants in the city and balancing the city's budget. Jordan was challenged for mayor in the 1995 mayoral election by Willie Brown, who was termed out of the State Assembly. Brown, considered by many to be one of the most powerful African-American politicians in the country, had been defeated only once in a run for public office. Brown and Jordan advanced out of a crowded field to a run-off election, where Brown was victorious. In the 1999 mayoral election, Jordan attempted a comeback bid for Mayor of San Francisco, but came in third place behind Willie Brown and Tom Ammiano. Since 2001 Jordan has served as special advisor to the president of the Gordon and Betty Moore Foundation and is the foundation's principal counselor on the impact of potential grants in the nine-county Bay Area. According to the foundation's 2007 annual report, in that year nearly $53 million in grants was devoted to the San Francisco Bay Area. Jordan holds a degree in government and political science from the University of San Francisco, where he has served on the Business Advisory Council since 1989, and teaching credentials from the University of California. As of the October 2017 Northern California wildfires he lived in Santa Rosa with his wife, Wendy Paskin. ^ a b "So far, Jordan is 2nd". SFGate. 1999-11-03. Retrieved 2018-08-20. ^ "Our Campaigns - Candidate - Frank Jordan". www.ourcampaigns.com. Retrieved 2017-04-07. ^ Press, Associated (1990-10-20). "Jordan Resigns as San Francisco Police Chief". Los Angeles Times. ISSN 0458-3035. Retrieved 2018-08-20. ^ "POA Scholarship Fund Receives Generous Donation | San Francisco Police Officers Association". sfpoa.org. Retrieved 2018-08-20. ^ "Frank Jordan, former SF mayor, loses home to Sonoma County fire". SFGate. 2017-10-13. Retrieved 2018-08-20. ^ WARREN, JENIFER; PADDOCK, RICHARD C. (1991-12-11). "Jordan Defeats Agnos in S.F. Mayor's Race : Election: Former police chief capitalizes on pledge to clear city of homeless and litter in ousting incumbent". Los Angeles Times. ISSN 0458-3035. Retrieved 2018-08-20. ^ COCKBURN, ALEXANDER (1994-09-22). "Feed a Vagrant, Go to Jail in San Francisco : The City by the Bay is almost medieval in its treatment of the homeless as inhuman". Los Angeles Times. ISSN 0458-3035. Retrieved 2018-08-20. ^ Jordan, Frank (March 30, 2011). 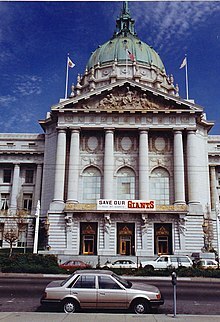 "A History-Making Ride from 1958 to 2011: San Francisco's World Champion Giants". Retrieved March 31, 2011. ^ Gross, Jane (April 18, 1992). "New Mayor's 'Shaky' Start Has San Francisco Puzzled". The New York Times. Retrieved May 17, 2016. ^ PADDOCK, RICHARD C. (1995-11-08). "Brown, Jordan in Close Race for S.F. Mayor : Election: Early ballot returns point to runoff for two front-runners. Computer glitch delays count for hours". Los Angeles Times. ISSN 0458-3035. Retrieved 2018-08-20. ^ "San Francisco Mayor Primary Race - Nov 02, 1999". Retrieved October 26, 2009. ^ a b "Frank M. Jordan". Retrieved 20 August 2018. ^ "Former San Francisco Mayor Frank Jordan to join Moore Foundation". Retrieved May 17, 2016. ^ Wildermuth, John (September 16, 1999). "Jordan Banks On Being Steady Flash, pizzazz not ex-mayor's style". Retrieved May 17, 2007. ^ Avalos, George (November 14, 2017). "PG&E slapped with more lawsuits amid North Bay inferno probes". Retrieved November 15, 2017. Wikimedia Commons has media related to Frank Jordan.